Republic TV – How will it perform based on Muhurat chart. “The whole world must know”……We all have been witnessing the development in media industry. Media is cursed by some and praised by some. There have been several takeovers and mergers in the past in the media industry. Out of many channels, Times Now has been in the limelight for various reasons and also because of the way Arnab Goswami conducts its prime time news. He has been both controversial as well as well-respected figure in the media industry. Recently, about 6 months ago he quit The Times of India group. His long presence of 5 months have been felt on the media. Recently, he started his channel “The Republic”, reportedly financed by Rajeev Chandrasekar is an Independent MP in Rajya Sabha from Bangalore, Karnataka, elected for a second term in 2012, unopposed and unanimously supported by all major political parties. He supports and is part of the NDA coalition and is currently Vice Chairman NDA in Kerala. He was part of the Opposition between 2006-2014. The Republic TV was on air for the first time on May 6, 2017 at 10.00 am. We are here going to analyse the chart based on above date with Mumbai as the place as Arnab Goswami operates from Mumbai. The following is the chart for The Republic. 1. The day was Saturday. It is ruled by Saturn. It is retrograde and aspected by Rahu and Mars from the 12th house. It is debilitated in the Navamsa. Saturn is in “Vish Navamsa”. This Saturn falls in the diety of “Rakshasha”. The Saturn is in the hora of Sun. The 64th navamsa lord and 22nd Drekkana lord of Saturn is Moon. When the planet is same and at the same time it is in Visha navamsa and in the hora of Sun, then it will only give malefic effects. In drekkana, the Saturn falls in “Durvaasa” section. So overall, the day selected is not at all auspicious. 2. The nakshatra is Uttara Phalguni ruled by Sun. This Sun though exalted in the Natal chart is again debilitated in the navamsa. Thus losing all its powers. This Sun, is lord of 3rd house of the natal chart. The 3rd house rules communications and media industry. In the Drekkana (this chart is seen as it signifies communications and media), the Sun is afflcted by being in conjunction with Saturn, aspected by Rahu and Mars from the 12th house. So, even the nakshatra chosen is not auspicious. 3. The tithi is “Shukla Ekadasi”. This is good and has no issue. 4. Yoga is “Vyaghata”. This is bad and no good work should be started in this yoga. This will give failures. 5. Karana is Vishti. This is also not good and it gives all sorts of obstacles and failures. 6. The Lagna is a dual sign though at 17 deg 46 of Gemini. In the Navamsa too it is Dual sign rising. For any long term projects a fixed sign should be selected. 7. The Hora lord is Sun. The strength of Sun is explained above. 8. In any chart, the Moon should also be seen and it is supposed to be having strength. The Moon is in the 3rd house in the Rahu/Ketu axis and also aspected by Mars from the 12th house. So Moon is heavily afflicted. 9. The Ascendant lord Mercury is in the 11th house. It is Vargottami. It is conjunct Gulika and Maandi. It is in the “Visha navamsa”. In the Navamsa, Mercury is conjunct debilitated Saturn and aspected by debilitated Sun. So, here Mercury is partly benefic. So overall, the muhurat chosen is not at all good. The Moon is in the star of Uttaraphalguni. This falls in “Patta” section and in “Narapati. A planet in the Patta section gives only limited powers. From this we can infer that the news being telecast will be dictated by the financer and he will only have limited power. He will be highly controlled. In the Kota chakra, the Kota Swami is the Sun and Kota Pala is Mercury. The Kota swami represents Arnab Goswami and Kota Pala represents the Financers. 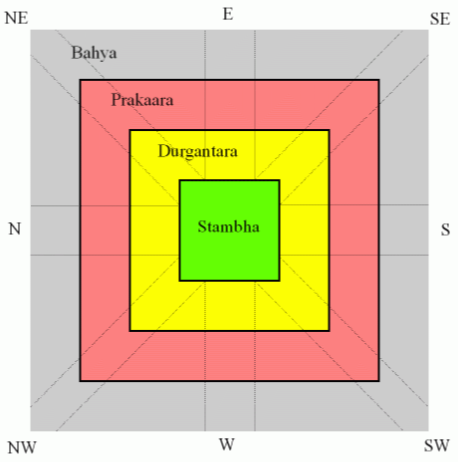 The position of Kota Swami is good and is placed in the “Durgantara”. However, the placement of Kota Pala, Mercury is not good as it is placed in “Stambha”. Kota Pala should ideally be placed in “Bahya” section. So the placement is of middling effect. The lagna rising is Mercury. The strength of Mercury is already given above in the Panchanga section. Since, we are looking at the media industry per se, we need to give importance to the 3rd house of the chart and the significator Mercury. The 3rd house is under heavy affliction as it contains Rahu and aspected by Mars from the 12th house. The 3rd house lord Sun, though exalted in the natal chart it is debilitated in the navamsa chart. In the Drekkana, the Sun is conjunct Saturn and aspected by Mars and Rahu. The Sun is very close degreecally to Gulika and Maandi. In the Drekkana, the Sun falls in diety of Durvaasa section. Above all the strength of 9th lord the house of fortune is to be analysed. It is lorded by Saturn, which is retrograde in the 7th house and aspected by Rahu and Mars from the 12th house. It is debilitated in the Navamsa. Saturn is in “Vish Navamsa”. This Saturn falls in the diety of “Rakshasha”. The Saturn is in the hora of Sun. The 64th navamsa lord and 22nd Drekkana lord of Saturn is Moon. When the planet is same and at the same time it is in Visha navamsa and in the hora of Sun, then it will only give malefic effects. In drekkana, the Saturn falls in “Durvaasa” section. The 2nd lord the Moon which signifies wealth is afflicted in the 3rd house by the conjunction of Rahu and aspect of Mars from the 12th house. However, Moon is in “Pushkaramsa”. But the affliction to Moon by other malefics takes away most of benefits of it being in Pushkaramsa. The 11th house lord Mars is in the 12th house of loss. Mars is in Pushkaramsa. The planets in the Pushkaramsa is supposed to give good results, provided it is well aspected and well placed in Rahi Tulya Navamsa. In the Rashi Tulya Navamsa, Mars is placed in the 12th house along with Rahu. –	The Republic TV will not do well and viewership will not be upto the mark. –	Arnab will be highly controlled by his Financers (Rajeev Chandrasekar). –	The channel will face financial crunch and due to which additional financers may be brought in at the later stage. Thank you very much sir for sharing such an elaborate analysis.